Of course, many DAs in this state do not believe that such things like convicting the innocent occurs. That’s the direct implication of their successful death penalty bill that won 52-48 percent of CA voters. 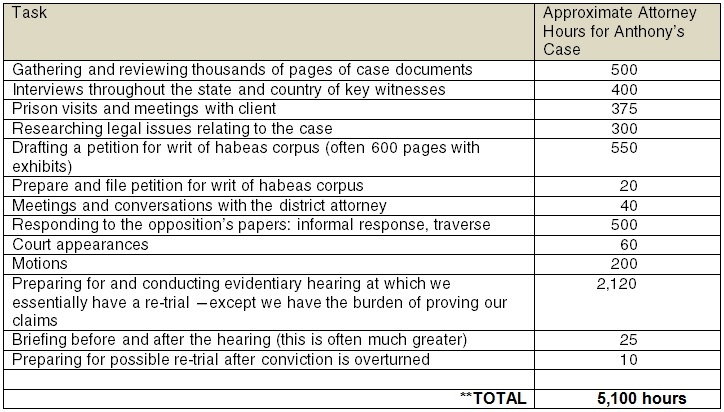 Read the numbers about how much the NCIP spends in time and equivalent costs for ONE exoneration. Full article. You might multiply these 5,100 hours x the NY Innocence Project’s current number of DNA exonerations of 347. The Registry of Exonerations shows over 1800 exonerations in total. This entry was posted in Uncategorized and tagged costs of wrongful convictions, exoneration, wrongful convictions. Bookmark the permalink.